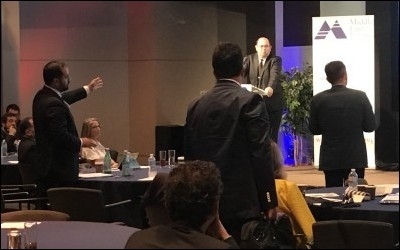 The Turkish delegation to the MEF–NATO PA event in Philadelphia loudly interrupted the proceedings before storming out as Emre Çelik took the podium. Philadelphia – September 19, 2017 – A conference hosted by the Middle East Forum (MEF) for the NATO Parliamentary Assembly (NATO PA) was disrupted when Turkish members of the delegation stormed out rather than listen to a dissident voice. Late last week, the NATO PA organizers asked that MEF remove a speaker, Emre Çelik, from the program in response to a demand issued by the office of Turkish President Recep Tayyip Erdoğan. MEF removed the speaker from the program, but invited him to address the gathering anyway. When Çelik rose to speak, the Turkish delegation grew visibly agitated and acted quickly to shut down the event, as seen in this video from the event. MEF President Daniel Pipes said, "NATO exists 'to safeguard the freedom, common heritage and civilization' of member states. But the Republic of Turkey has betrayed those principles. President Erdoğan's attempt to stifle free speech at a Middle East Forum event today was despicable. We did not accept it." 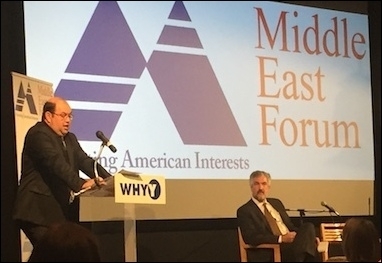 Emre Çelik addresses the audience as MEF President Daniel Pipes looks on. MEF Director Gregg Roman added: "We were honored to host the impressive delegation from the NATO Parliamentary Assembly. Its staff should not have acquiesced to an egregious demand from an autocrat. I hope the parliamentarians appreciate our stand for freedom of speech." The conference, which took place in Philadelphia September 18 and 19, gave the legislators an opportunity to hear from many of the experts on NATO's strategic interests in the Middle East. Panels explored regional issues, the situation in Syria, and the need to combat Islamism. Speakers at the conference included Tony Badran, Usama Hasan, M. Zuhdi Jasser, Lee Smith, Zainab al-Suwaij, Michael J. Totten, and Cem Utkan.